Again Patricia De Lille has left her political home and has once again established a new political party. I think back to 2003, when I was an intern floating about the Parliamentary Precinct, doing nonsensical things; and Patricia De Lille left the Pan Africanist Congress of Azania (PAC) and established the Independent Democrats (ID). Resplendent in a colour scheme of orange, black and white and promising an optimistic alternative to the corruption of the African National Congress (ANC), and an optimistic alternative to the aggressiveness of the Democratic Alliance (DA), the ID was born. Some years later, after benefitting from the “New Political Party… In It’s First Election Outing” votes; the ID joined the Democratic Party (DP) and the Federal Alliance (FA) in the Democratic Alliance (DA) and then some time after that, dissolved the ID and went “all-in” with the DA. This meant that Patricia De Lille had no way out, it wasn’t possible for her and her followers to leave the DA and to return to their own political platform; that is it wasn’t possible to disengage the ID from the DA, because the ID had been dissolved. So now, that the DA has decided that Patricia De Lille wasn’t, isn’t and isn’t going to be liberal enough, the DA has sought to remove Patricia De Lille from being able to represent the liberal DA publicly. This evidently wasn’t acceptable to Patricia De Lille, who stated that the ID was the actual platform that she wanted, because she created the ID, and who stated that the DA was the actual alliance that she wanted, because she fostered the ID-DP-FA and ID-DA relationships that I created. And now having been removed as an ordinary member of the DA, Patricia De Lille had no choice but to start her own political party. She was removed as a Public Representative of the DA and as an Ordinary Member of the DA; and for a politician that is equivalent to being tossed out on her ear. 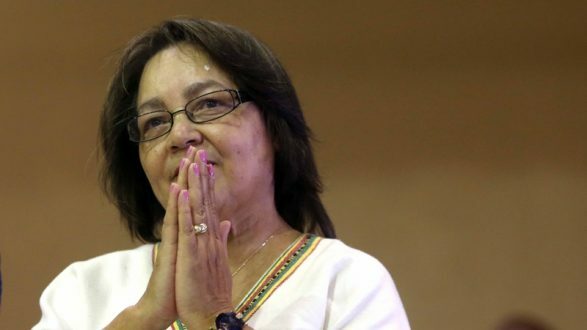 Completely without recourse to membership of the DA; left only with her supporters from the PAC, who followed her, with her supporters from the ID, who followed her and with her supporters from the DA, who followed her; De Lille first said that she wanted to be a force for good and now says that her political party is called GOOD. Literally she wants you to choose GOOD, to vote GOOD and to vote for GOOD. In a depressive country like South Africa, where bad news dominates the headlines; asking people to choose GOOD, to vote GOOD and to vote for GOOD is like asking a drug-starved, crack-addict to ask for more free crack. Its a “no-brainer”, South Africans will no doubt find a measure of positivism in their persons and derive, from that, the inclination to cheer for GOOD. This is what Patricia De Lille is hoping for, that South Africa will see the political party GOOD as an alternative to the BAD-conduct from the ANC, the BAD-news from the DA, and the BAD-mentality from the other opposition political parties. This does not impress me at all. You see, I am not a big fan of Patricia De Lille now, because I wasn’t impressed with the reports of her congress-like disposition while Mayor of Cape Town. This is important because I supported her when she left the PAC, and started the Orange, Black and White ID; I supported her when I brokered the ID-DP-FA and ID-DA relationships; and I supported her when I pushed for her to become mayor of Cape Town. But I cannot support her now, in what portends to be a reboot of the ID; which by the way is still a part of the DA. So this is my official notice that: like the one started by NUMSA, the political party known as “Socialist Revolutionary Workers’ Party”; the one started by Patricia De Lille, the political party known as GOOD, is disqualified from benefitting from the votes allocated to “New Political Party… In It’s First Election Outing”, because neither have impressed me with their integrity, and because neither have impressed me with their determination to distinguish themselves as options. The political party known as GOOD, is a reworking of the ID; and is going to leech off forgood.co.za, because forgood.org.za and GOOD are not propositions that will be easily distinguishable from the volunteerism platform forgood.co.za. This immediately disqualifies the political party known as GOOD from being a prospective beneficiary of the “New Political Party… In Its First Election Outing” bloc of votes. They don’t pass begin, they don’t collect 200 and they don’t get to play. That’s all, finished. For the Socialist Revolutionary Workers’ Party (SRWP) to have impressed me with their integrity, they would have adopted a charter from NUMSA that specifies how the industry that NUMSA serves will be improved, in terms of both quality and quantity of production, for a lower retail price of the products and for a more accessible product range that takes new energy technologies into consideration. For the Socialist Revolutionary Workers’ Party to have impressed me with their determination to distinguish themselves as an option, they would have defined their own brand of socialism that doesn’t function on a tax-and-spend or a tax-and-provide model and that doesn’t rely on borrowing to fund expenditure. Alas the Socialist Revolutionary Workers’ Party does not impress me at all. For GOOD to have impressed me with their integrity they would have secured more than just one headline politician, that is Patricia De Lille would have been one of many headline politicians, not the only one. That would have said that, “this thing has traction and is going somewhere”. To have impressed me with its determination to distinguish itself as an option, GOOD would not have reminded me of the ID in any way whatsoever. GOOD is simply a cheap trick to split the DA’s vote for the benefit of the global-congress-movement. SRWP is simply another version of a proto-ANC party breaking away from the tripartite alliance and taking votes off the opposition who should get votes from those that are disaffected and disillusioned with the ANC. The UDM did this, the COPE did this and the EFF did this; and they did this while proving that they were not just clandestine actions of the ANC and they did this while proving that they were “anti-corruption”. Within one term they were proved to be ineffectual against the ANC and that they were proved incapable of condemning the ANC’s corruption. GOOD will be not profit at my hands and GOOD will not benefit from my hands, in fact I had hoped to discourage Patricia De Lille from starting a new political party altogether, because the 2019 elections is about consolidating support for the DA, to actually beat the ANC in the provincial and national elections, and thereby give South Africa another opportunity to defend itself against becoming a failed state. We are literally on the brink of becoming a failed stated; and no amount of “socialism”, “revolutionism” and “workerism” will save us from this disaster. Similarly no amount of “make-yourself-feel-better” by “celebrating the GOOD” and by “maintaining optimism in the face of adversity” will save us from this disaster. DIGRESSION: This reality of the forthcoming failed-state status is written, in our national and domestic debt, in our balance of payments and in the shortfall of our taxation income against our treasury expenditure. This reality of the forthcoming failed-state status is written, in our loss of territory, name, population and sovereignty to the creditors who are paying off the President’s, Deputy President’s and Executive’s blackmail and extortion debts. You have been talking about these creditors as those who were implicated in the state of capture of the public sector (state capture). These creditors are people who pay off blackmail and extortion claims that are made against the President, the Deputy President and the Executive, in an attempt to influence state favour and state expenditure. This is going to go on, unchecked, for as long as the ANC is in power, because the fact is that Mkonto We Sizwe (MK) was cultured as a crime syndicate when the ANC was banned and in exile. This, together with the fact that MK was only partially absorbed into the South African National Defence Force (SANDF), with only some of MK’s Intelligence Directorate being absorbed into the Ministry of Intelligence Services’ (MIS) National Intelligence Agency, South African Secret Service, South African Police Services’ Crime Intelligence Directorate (SAPS-CID) and the South African National Defence Force’s Military Intelligence (SANDF-MI); and with most of the political leaders from MK being allowed to enter the political mainstream. This means that while Nelson Mandela, Thabo Mbeki, Kgalema Motlanthe and Jacob Zuma served as Presidents they were being blackmailed and extorted about crimes that they were alleged to have committed. Generally, the clandestine services, now called the State Security Agency and the Ministry for State Security; pay off the crime syndicates that cannot be broken; and where they are unable to break the crime syndicates or pay off the crime syndicates, they enlist the help of business-people who are, themselves, also being blackmailed and extorted with their drinking problems, gambling problems and drug problems. Now that Cyril Ramaphosa is President, it is a different kettle of fish, because here is a businessman that was being blackmailed and extorted like all high profile business-people, and that now is being blackmailed and extorted as the President. This is not a simple situation and no amount of “someone-will-pay” will sort it out. Agents of State-Capture, which essentially mean we will pay for you, in exchange for you recognising the legitimacy of our “kitchen-cabinet”; cannot sort it out. So I will sort it out and I will refuse to allow anyone to corrupt that process in any way whatsoever. So our President can, until the start of the new government next year, continue to condemn State Capture, Corruption and Maladministration without fear of being blackmailed and extorted into abandoning these positions. The ANC has to go next year, that is following the 2019 elections, because the ANC has run out of ideas, is talking nonsense and does not have a plan for the immediate future. That being said, the ANC does not have a plan for South Africa over the next decade from 2020 to 2030, because the ANC relied on the shortcuts provided by the National Party (NP) and New National Party (NNP) in 1992, 1994, 1999, 2004, 2009 and 2014, and because the ANC relied on the shortcuts provided by the NP and NNP in 1996, 2001, 2006, 2011 and 2016. This is simply a case of the elite leadership of the ANC knowing that they received support in the form of a bloc of votes for nationalism. They have never acknowledged this publicly but the fact is that the NP and the NNP joined the ANC and then ceased to exist on their own. This situation is dire, and one that cannot be wished away, the political party known as SRWP is not a solution and the political party known as GOOD is not a solution. The ANC has run out of both energy and momentum to lead, and must spend some time on the opposition benches, rebuilding the ANC from the ground up; and actually making an offer to the people that is not predicated upon the ANC-NP-NNP deal. This is simply because the ANC-NP-NNP deal was about finding common ground between Afrikaner Nationalism and African Nationalism; both representing people that had been defeated by the British and both representing people who represented economic minorities. This common ground shone through at CODESA and in the Constitutional Assembly, and did not break down at any time. Therefore to return from this digression, the political party known as SRWP and the political party known as GOOD will not be among the beneficiaries of the “New Political Party… In It’s First Election Outing” bloc of votes; and this is simply because they have not impressed me with their integrity and they have not impressed me with their determination to distinguish themselves as options. The net effect of SRWP and GOOD will be to split opposition votes, to counteract the consolidation of support for the DA, and to enable to ANC to retain power, without any legitimacy and without any real popular support. The ANC does not have 10-million votes of its own. Nationalism had, before my intervention, 10-million votes of its own; and corruption previously had 5-million votes that it bought, which it doesn’t have now — because I have intervened and corruption doesn’t have anything. That leaves the one million or so, members and near-members of the ANC; to account for the 16-million votes for the ANC in 2016. Neither SRWP nor GOOD will take away from these “ANC nationalism votes”, given the habitual nature of Nationalism; neither SRWP nor GOOD will take away from these “ANC Corruption Votes”, given that both SRWP and GOOD have stated anti-corruption positions; and neither SRWP and GOOD will take away from these “ANC Member Votes”, given that neither SRWP and GOOD are breaking away from the ANC itself, directly. NUMSA and SRWP are breaking away from the COSATU-ANC-SACP tripartite alliance and relationship; while GOOD is breaking away from the ID-DP-FA and ID-DA relationships. This being said, I reiterate, to respond to the demands that have already been made upon me to support ANC, “no”; to respond to the demands that have already been made upon me to support SRWP, “no”; and to respond to the demands that have already been made upon me to support GOOD, “no”. And for the obvious among us, I reiterate that I will not be supporting the ANC in any way in and during the 2019 elections. Not ANC, Not Vote ANC and Not Vote for ANC. Not Choose ANC, Not Choose Vote ANC and Not Choose Vote for ANC. Not Support ANC, Not Support Vote ANC and Not Support Vote for ANC. I must in good conscience ask and invite you to do the same, that is, to not support the ANC, in any way whatsoever, and to not support other opposition political parties; instead to consolidate support for the DA, to choose DA, to choose Vote DA, to choose Vote for DA, to Support DA, to Support Vote DA and to Support Vote for DA. Therefore I mean DA, Vote DA and Vote for DA. This is because its not all GOOD, and because it won’t be solved by SRWP, that to allow the cowards to scurry away from their dramas and to establish new political parties, whether SRWP or GOOD; to generally herd votes away from the DA — is simply an offensive action of the global-congress-movement that acts in this manner, crafting stage positions that are designed to retain power for illegitimate congress parties. This is not something new and not something that will fool anyone. And so I must urge you to not be conned by the ANC, the other opposition political parties, the political party known as SRWP or the political party known as GOOD; and to choose instead DA — to consolidate all your support for DA, and to put DA into power across all provinces and nationally; this is the only way to turn this country around and to stave off the failed-state status that is lurking around the corner. It’s not about the nationalist rhetoric of the early 1990’s and its not about the conservative rhetoric of the early 2010’s; it is, however, about the nature and nurture of the state of the Republic of South Africa, post 25 years of freedom and democracy (1994 – 2019); which was negotiated in part by the DP, itself a forerunner to the DA; and whether, by nature, the State of the Republic of South Africa will be one that is imbued of and personified by its own territory, its own population, its own name and its own sovereignty; or whether, by nurture, the State of the Republic of South Africa will have forgone its entitlement to these things — choosing instead an illegitimate government that sinks into debt on an ongoing basis. The power to effect this change is in your hands: You can vote sanity to power, by choosing DA and supporting DA, by choosing Vote DA and supporting Vote DA and by choosing Vote for DA and supporting Vote for DA; You can vote responsibility to power, by choosing DA and supporting DA, by choosing Vote DA and supporting Vote DA and by choosing Vote for DA and supporting Vote for DA; You can vote true freedom to power, by choosing DA and supporting DA, by choosing Vote DA and supporting Vote DA and by choosing Vote for DA and supporting Vote for DA; You can vote respect to the power, by choosing DA and supporting DA, by choosing Vote DA and supporting Vote DA and by choosing Vote for DA and supporting Vote for DA; and You can vote the rule of law to power, by choosing DA and supporting DA, by choosing Vote DA and supporting Vote DA and by choosing Vote for DA and supporting Vote for DA. That is DA, Vote DA and Vote for DA.